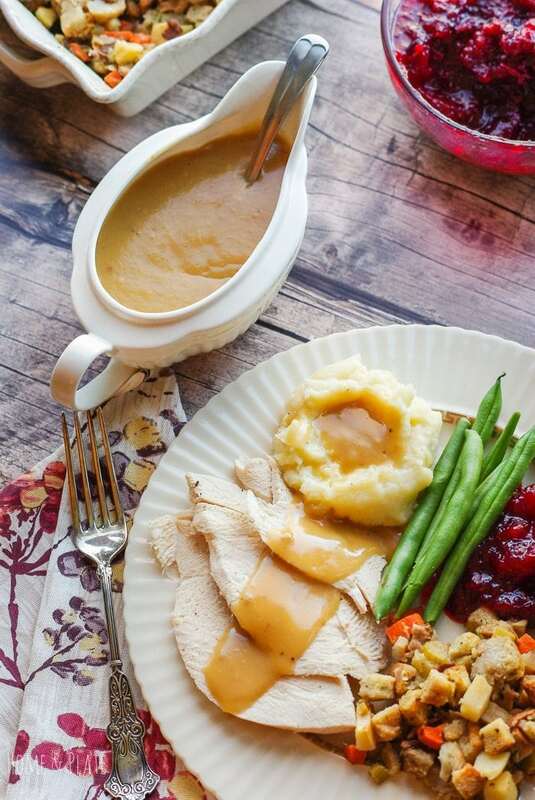 What do you traditionally serve for dinner at Thanksgiving and Christmas? In many houses across America the answer is turkey! Thanksgiving is always at my house and the whole gang is in attendance. I have been cooking the meal for years and have experimented plenty. We’ve grilled the turkey, fried it, smoked it and roasted it. We’ve done it all. It’s always fun because everyone want to partake and help with the meal. And thank goodness for helpers. It’s the one time of the year that “too many cooks in the kitchen” is no problem. The potatoes need to be mashed, rolls need to be baked, the gravy needs to thicken, the beer and wine need to be opened. Who am I kidding…it’s already opened. We’ve been enjoying the day with a few cocktails and shrimp appetizers. Christmas is another story. I have the night off. My sister and her husband handle the culinary duties and I get to be the taste tester. Turkey is customary at Thanksgiving but not always at Christmas which is why turkey duty falls to me. My family loves it because turkey day starts the night before with the brine. It continues the next morning with preparing the turkey and giblet gravy. I have perfected the gravy over the years with the help of my family members who have shown me their skills in the kitchen. I have learned from the best. 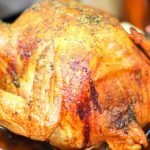 What should I serve with turkey? 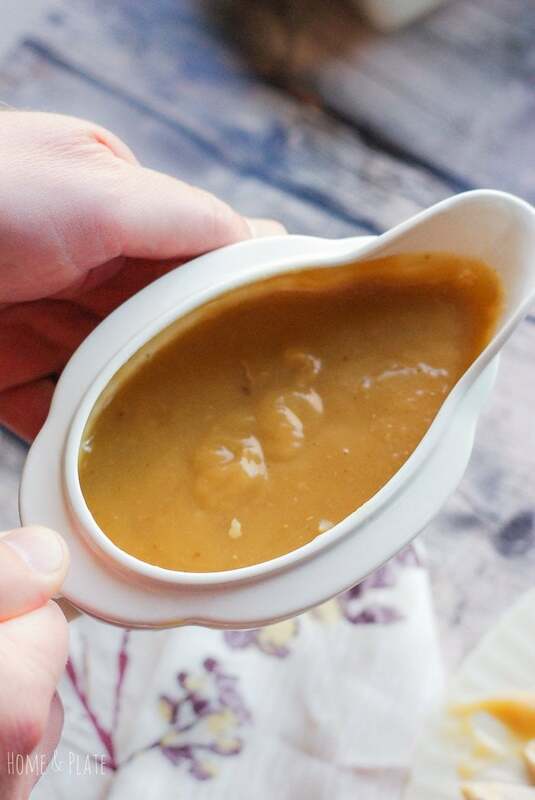 Be sure to get my homemade giblet gravy to serve over your mashed potatoes and roasted turkey. If Christmas were celebrated at my house I’m certain I would be on turkey duty. After all, I do make a gobble good turkey. My methods can be used any time of the year. Many times I will opt for a fresh turkey breast if I don’t want to cook the entire bird. So let’s get started. Follow along on how to brine your turkey, make homemade turkey broth and how to oven roast the juiciest most flavorful holiday turkey. Sometimes it’s about trial and error. Below I’ve included a simple, printable recipe card to get the job done on turkey day. Should I purchase a fresh or frozen turkey? First you’ll need a fresh turkey. You may even need to order one from the grocer to be sure you get one big enough to feed all your guests. It’s better to have too much turkey than too little. Plus there always needs to be leftovers. A great rule of thumb is – one pound of turkey per person. 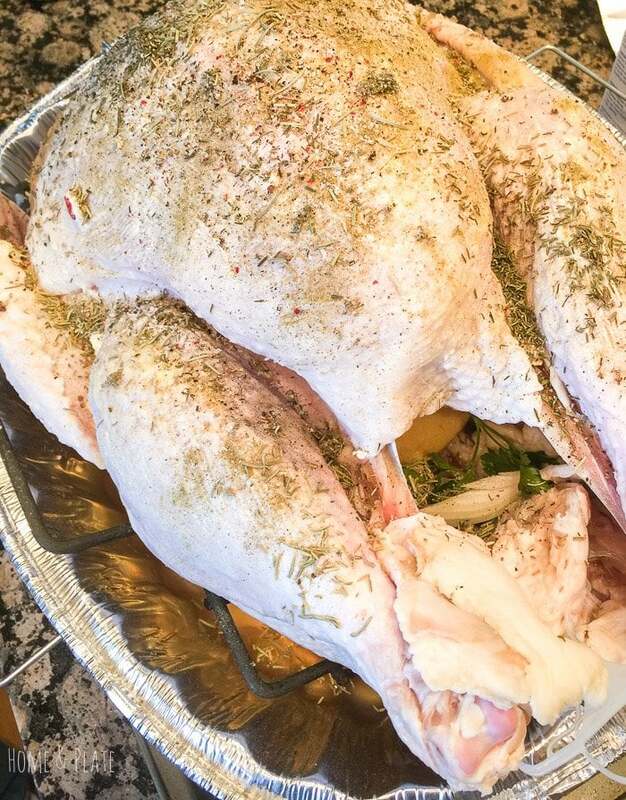 What do I need to brine a turkey? 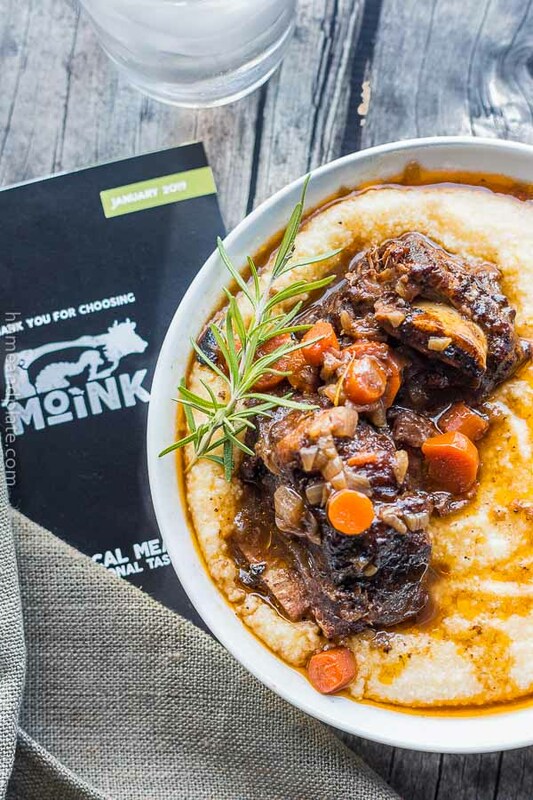 Starting with the brine, pick up a few items at the grocery store to make brining super easy. 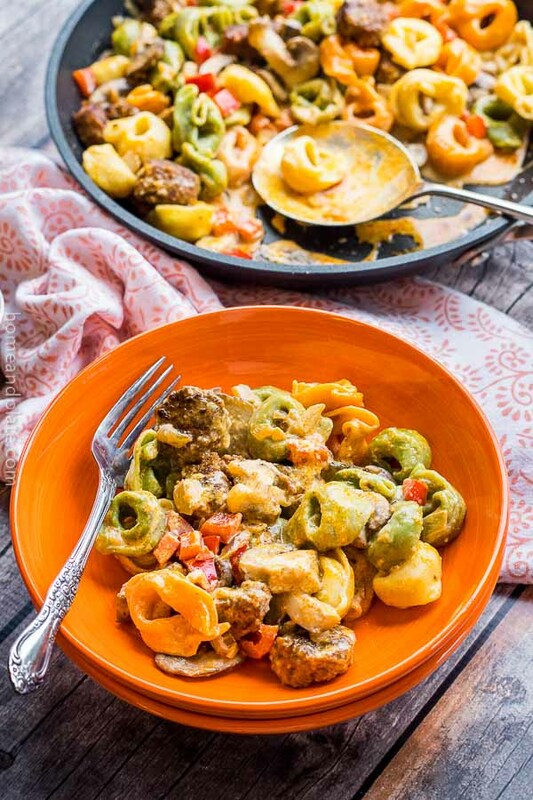 Pick up oven cooking bags and an empty 12-bottle box from the wine department of your grocery store for the brining supplies. The wine box will provide support while the turkey is taking an ice bath. If you are brining a smaller bird, the crisper drawer of your fridge works great too. Make sure you have a large enough pan to roast the turkey. I have a high-quality roasting pan that fits about a 12-pound turkey. I always buy a disposable pan at the grocery store when picking up my turkey and other supplies. I will place it on a cookie sheet for extra support in the oven. After all, nobody wants to have to clean up their oven in addition to all the other dishes that need to be cleaned up. Don’t forget your thermometer! Check to make sure the turkey is cooked through to 165 degrees F.
Remember it will continue to cook while it is resting and can sit out for an hour and a half while you are preparing the rest of the meal. Always use a electric carving knife to slice your turkey. It saves the day and makes each piece uniform in size. Save those turkey drippings. It’s the secret to delicious turkey gravy! A Brined Oven Roasted Turkey is the juiciest showstopper on your holiday table. Line a wine box with a large oven cooking bag. Use a cooler for extra support if needed. Prepare the fresh (not frozen) turkey by removing it from its packaging and setting aside the neck and giblets from inside the cavity of the turkey. On the stove top, boil two cups of water, salt, sugar, cinnamon stick and bay leaves until the salt and sugar have dissolved. Remove the brine from the heat and add 4 cups of cold water. Place the turkey in the cooking bag and add the brine and enough water to cover the bird. Add a layer of ice cubes, about 3 cups. Tie up the cooking bag. Place the turkey outside overnight if the temperature is between 30 and 35°F. Otherwise use the crisper drawer of your refrigerator instead of the wine box. Let the turkey marinate for at least 10 hours or overnight. Once the turkey is done brining, rinse the bird and pat dry with a few paper towels and place it in a roasting pan. Add all the ingredients to a 2 quart saucepan and bring to boil. Reduce the heat to low, and let the stock simmer for about an hour. 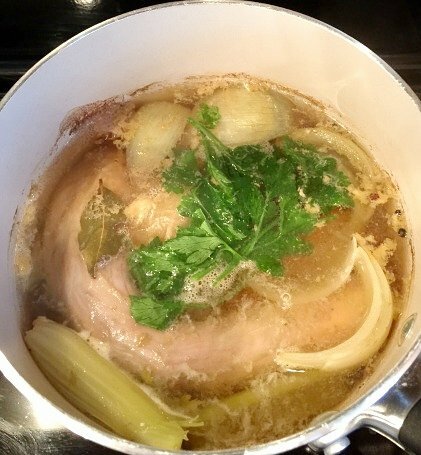 Strain the stock and remove the solids, saving the liquid and the chopped meat from the neck. Adjust your oven racks accordingly and preheat your oven to 350°F. Fill the cavity of your turkey with sliced onion, fresh parsley and apple quarters. Melt a quarter stick of butter and brush the top of your bird using a pastry brush. Sprinkle dried sage, thyme, rosemary, kosher salt and fresh ground pepper over the bird and even tuck a few fresh herbs under the skin. Place your turkey in the oven and cook accordingly based on the size your turkey. 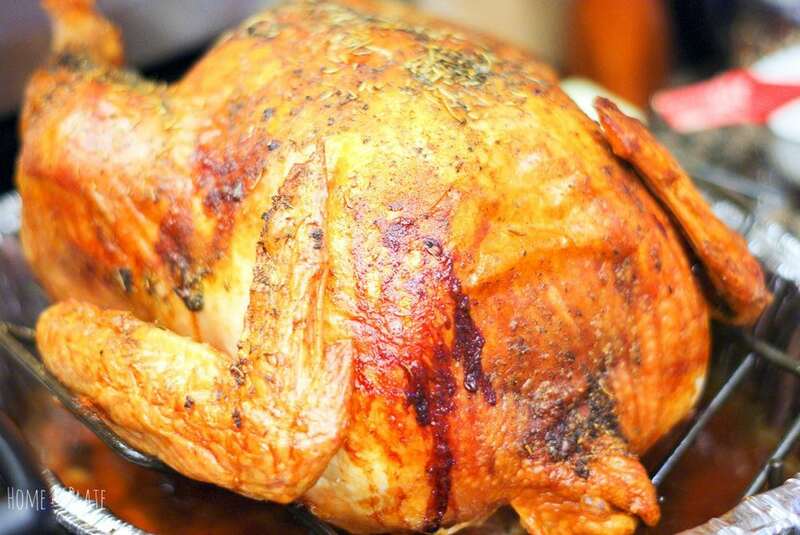 A 20-pound turkey will take 3.5 hours in a convection oven or 4 hours in a standard oven. Also, if your turkey has an instant popper, it's a pretty good indication your turkey is done if the popper has popped. I always tent the top of the turkey with foil once it has browned for about an hour. Always check the temperature of your turkey with a thermometer in the deepest part of the thigh. The temperature should register at 160°F. Let the turkey rest for at least 20 to 30 minutes before carving. It will continue to cook while resting. Choose a large enough turkey to feed your family leftovers, about 1 pound per person. Make sure you have a large enough pan to roast the turkey. Save the turkey drippings/stock to make your gravy. Do not use a pre-seasoned turkey or self basting turkey otherwise it may result in an overly salty turkey.